You’ll find detailed instructions with illustrations for each trick immediately following this kind-of long introduction. Number 3 above, using Markup in the ios Notes app, is something I spent a lot of time on one day…I was trying to figure out if this was even possible to do. I finally concluded it wasn’t…at least not presently. But then a few days later while I was again working within the Notes app I accidentally discovered how to access Markup within Notes…and guess what? It’s become a great time saving tool for me. That’s one aspect of Evernote that I really love and it’s one important reason for Evernote’s solid ranking as #1 amongst note taking apps. Evernote calls this feature annotate. 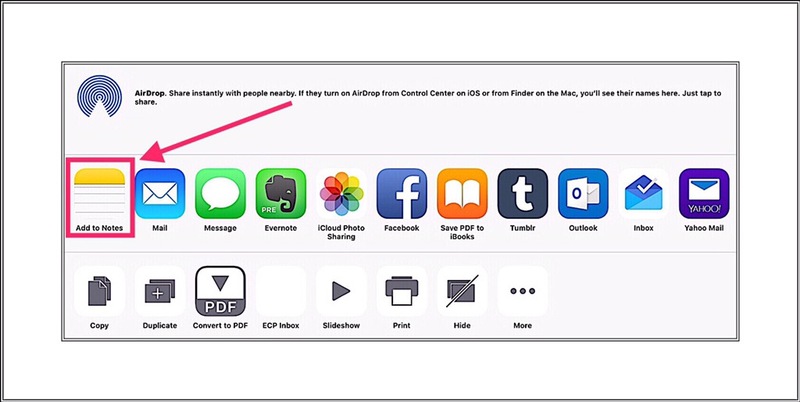 They allow you to annotate both images and PDF’s that are attached to your notes. No competitor I’d tried to date offered this feature, yet it’s one that I use every day. Specifically, I can place any image (a photograph, a chart or diagram, a screenshot, color sample tiles, or even a hand drawn illustration) into a note and then mark it up by ‘writing’ on it or by adding graphics to it, things like like framing sections within it for example…using lots of different colors. I can add typed or handwritten text, arrows, checkmarks, I can circle things, border things or put big X’s on…I can even remove distracting elements appearing on the original by writing over them in my background color…the possibilities are limitless! That’s what the word Markup means…it’s a popular, newly coined term from the digital age I think. Markup is, I’m pretty sure, what Apple calls this…but there’s another similar term that’s easily confused called Markdown. My understanding is that Markdown refers to a sort of shortcut language used for building web sites and online content. It replaces HTML which is the primary code type used for web work. But both were created in part for their operability with online content. So it’s easy to get them confused. Here’s my guide to usage of both terms. Generally you can let the content decide the meaning. Both terms are used interchangeably often…and incorrectly often…by me and many other people too. So if someone is talking about MarkXXXX and it’s a conversation on annotating things they mean Markup. If they are talking about coding for their website…it’s Markdown. But if they are talking about coding and say Markup….you’ll know that they really mean the Markdown language for web creation. Ultimately, I can even save the final ‘marked up’ image back to my camera roll with all my new additions or markups on it! In Evernote my markups are nondestructive.That means that I can reopen the image whilst in Evernote and remove or change the marked up bits. I can accomplish this feat anywhere, at anytime…as long as I have something that gets me online. This is such a useful tool for me that it bears repeating…that the ability to annotate my content is a significant reason that Evernote retains it’s revered #1 spot in the lineup of apps that I need for writing my blogs and creating graphics for my YouTube channel. 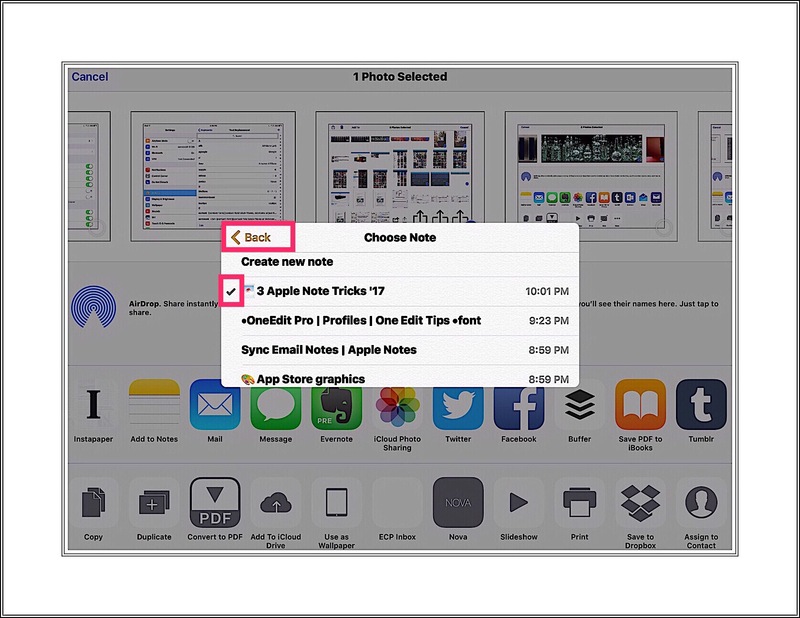 If you’re interested, here is another recent article I published following ios 10’s release, which compares the new and improved Apple Notes to Evernote. Lately Apple has been releasing updates for ios 10 monthly, so I figured my failure to find this feature might have been their oversight which meant that it would probably be remedied soon. Then just a few days ago I found that I could do this after all! Whether this omission fixed or I just completely missed it initially I’ll never know…but I had just installed an update to ios and I have noticed a lot of other little tiny glitches in the Notes app that no one else would ever pickup on have also been tweaked, or fixed. It’s an important enough of a discovery that I think it may have a much wider audience than the batching capabilities which I also discuss in this post. That’s why I’m singling it out. 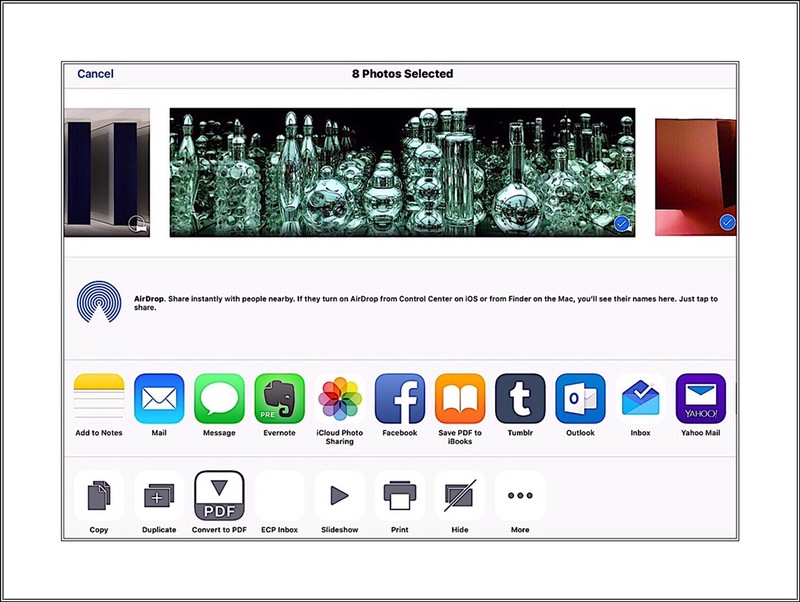 To be completely truthful, I remember Apple rolling out Markup in ios 9 on a limited basis. It was only available within the Mail app and I never had any need for it so I never used it in ios 9. This can be accomplished in 2 ways. 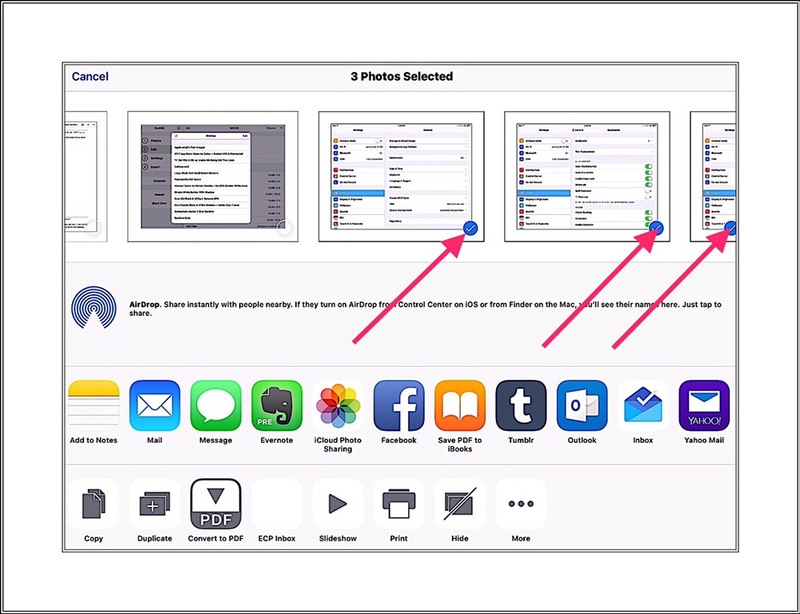 This method is primarily carried out in the Photos app. 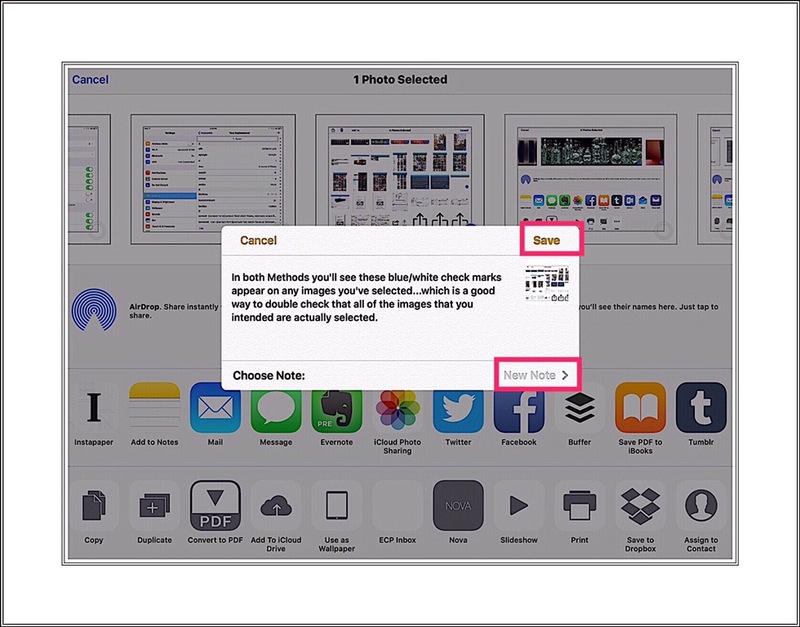 It involves selecting and copying several photos and then opening the Note’s App note to paste them in. Tap on the Share icon ⍐︎ that appears in the upper left corner. A new screen will appear with 2 lines of menus at the bottom. Use the 2nd, or the bottom menu and look for copy command. When you find it tap on it. Go to your note and place the cursor in the exact position that you want the images to appear. Long-press in that location until you see a popup menu with the word ‘Paste‘ and tap on Paste. The images will appear here momentarily in the order that you selected them. This method requires a little forethought to batch-add the photos in a precise spot. It’s also carried out from within the Photo’s app (aka the camera roll.) The reason forethought is necessary is because you can’t easily manipulate the placement of the photos using this method…the photos will all be added to the end of your note. But you can designate their order. So if you think ahead as you’re creating or writing a new note, it’s easy to orchestrate adding multiple images as you write. Begin writing a note and when you arrive at a place where you’d like to add images, stop and create or find the images you want to add, getting them into ‘final form’ in the camera roll. 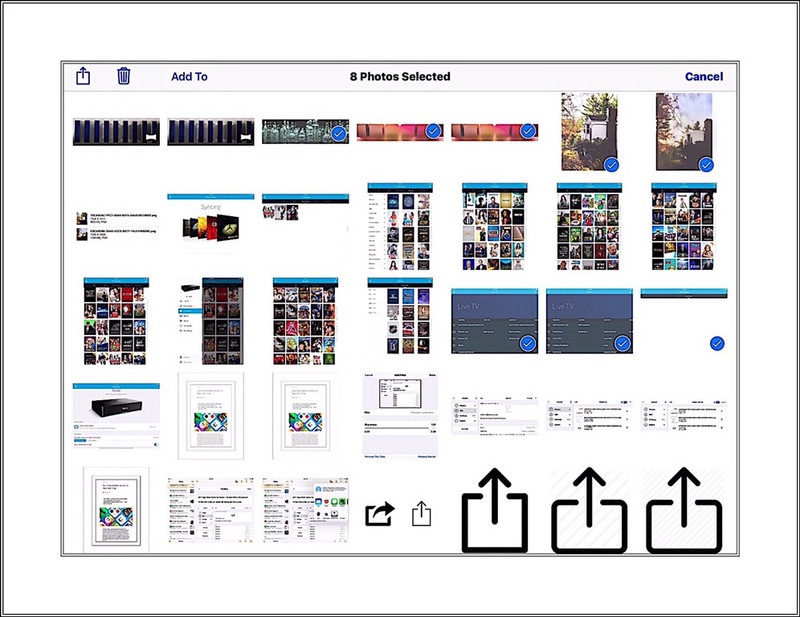 Go to the Photos App and using the word ‘Select‘ in the upper right corner, select all the photos you want inserted into your note using the exact same selection process described in Method 1. Make sure that you select them in the same order that you’d like them to appear within your note. 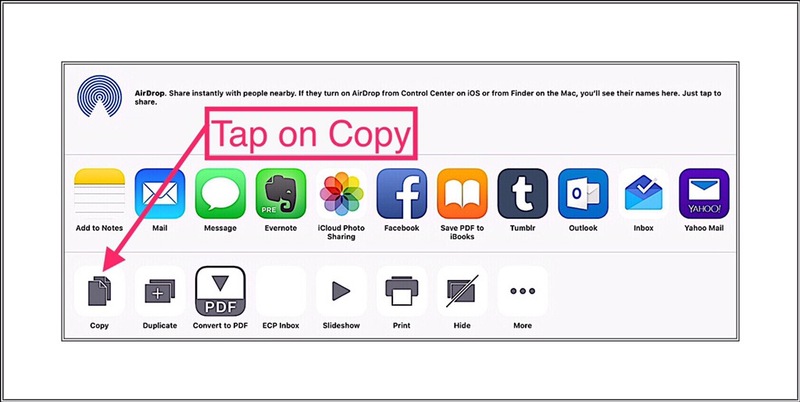 This time, rather than tapping ‘Copy‘…look for the Note 📝 icon in the top menu row of apps and tap on it. A little Note pop-up will appear where you can select the note that you want the images added to. You can also add some additional text here if you’d like. Below is a screenshot of the note pop-up, which I’ve already added some text to. After you’ve added the text you want tap on the words ‘New Note‘ on the bottom right to select the note you want the images attached to. Below is a screenshot of the list of notes displayed. There are more revealed by scrolling down. Just tap on the note you want and a check mark will appear in front of that note’s title. If you make a mistake just select another one. After you have the correct note selected, tap on the word ‘Back‘ in the upper left corner. You’ll be taken back to the first pop up screen. Then tap on the word ‘Save‘ (shown in the first screenshot directly above) in the top right corner. 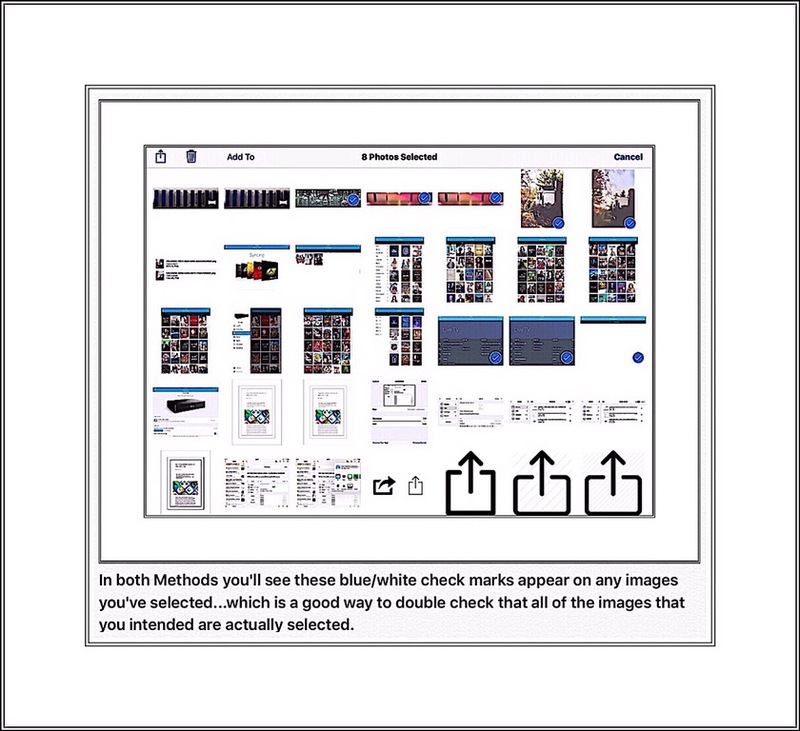 In both Methods you’ll see the blue/white check marks (displayed above and below) appear on any images that you select…which provides a good way to double check that all of the images you intended are actually selected. This is super easy to do and I just discovered it by accident today. 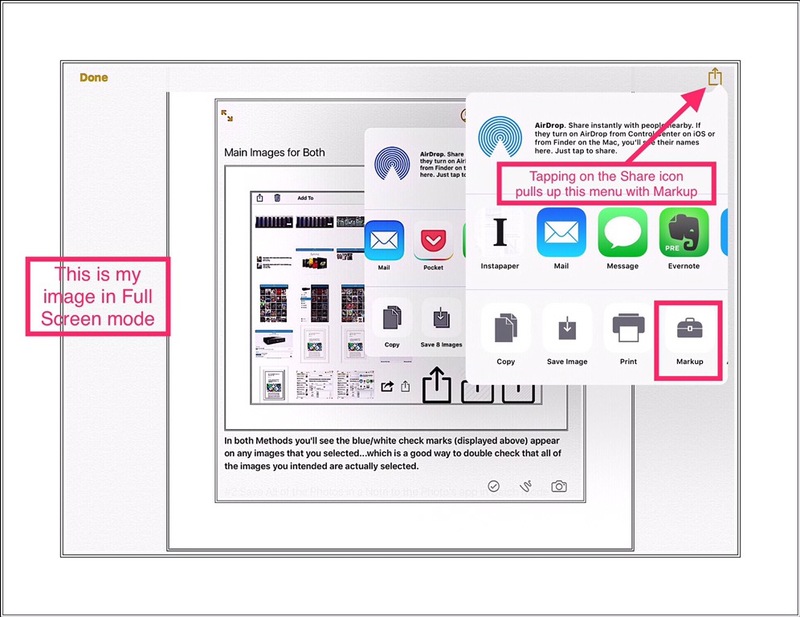 If you want to save all of the images in a note to the camera roll, you can do so in one fell swoop just by tapping on the Share icon ⍐︎ in the upper right corner of a note and then selecting the “Save x # of Images” command in the pop-up menu that appears. See below. After spending quite a bit of time trying to figure this out, my efforts yielded nothing. Then today, I just happened to stumble upon a way to do it while I was working on a note with images. It’s super easy when you know what to do! Just tap on a photo or image that’s already in a note. 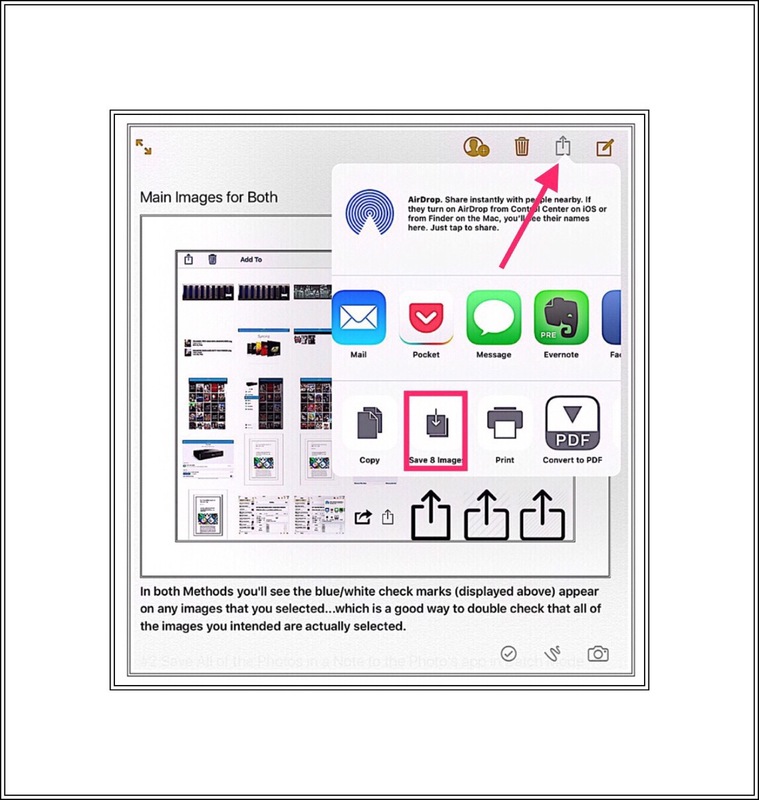 This puts the image into ‘full display mode.’ Then tap the Share icon ⍐︎ in the upper right hand corner of the image. After you’ve done that a pop-up menu will appear, showing Markup as one option. This entry was posted in Apple, Apple apps, Apps, ios, iPad and tagged add Multiple Photos to Apple notes, Annotate Apple Notes ios, markup in Apple Notes ios, Markup ios photos, Markup Photo Apple Notes, Save all a notes photos at once. Bookmark the permalink.